"I love coming home to that little dog." 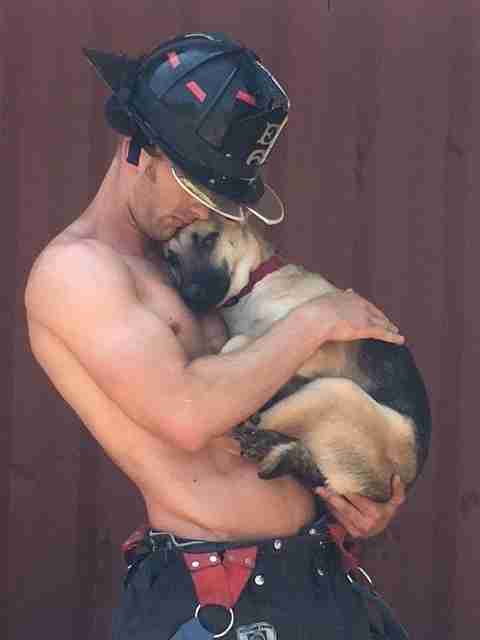 Rob Tackett met Kimber the day he posed shirtless for the Charleston firefighter 2017 calendar, which benefits a medical fund for animals at the Charleston Animal Society in South Carolina. 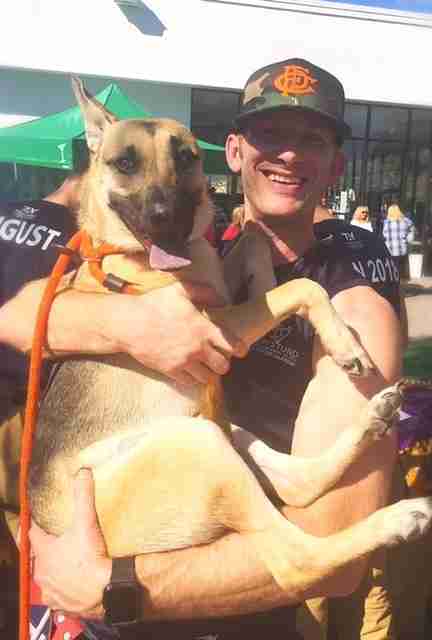 Tackett was "Mr. March," and Kimber, a 13-month-old German shepherd puppy, was placed in Tackett's arms for the photoshoot. "She was a little skittish at first, but once I petted and picked her up, she just fell into my arms," Tackett told The Dodo. "Right there, I was like, 'I love this dog.' It was instantaneous." Kimber's owner, Steve Hall, was at the photoshoot with his wife. They couldn't get over the connection between Kimber and Tackett, and how comfortable Kimber was with Tackett. Last February, Kimber was picked up off the streets and brought to the Charleston Animal Society. She'd been shaky, and was malnourished and covered in mange - so much so that they couldn't even tell what breed of dog she was. Something had also happened in Kimber's past that made her wary of men. But Kimber wasn't afraid of Tackett. "Before I even met her, [Hall's] wife came up and met me outside of where we were doing the calendar," Tackett said. "And she said, 'Just to warn you, she was very badly abused by her previous owners, and she's very skittish of men. She usually doesn't even let men come near her.' I said, 'That's fine. I understand completely.' But that didn't seem to be the case with me. Kimber just fell into my arms, and let me carry her around like a baby the entire day." After the photoshoot Hall and Tackett - both war veterans - stayed in touch. "We were both deployed at the same time, so we bonded over that," Tackett said. "We hung out with the family, went to the beach together and went out to lunch a lot." 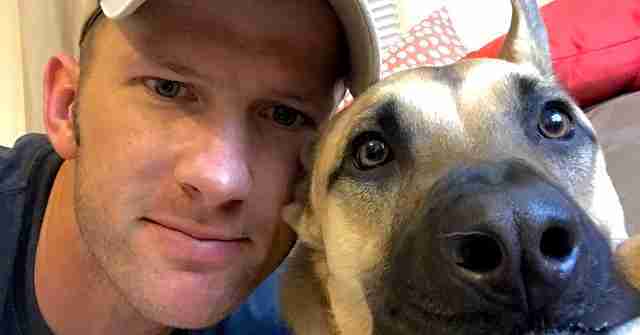 Hall suffers from PTSD, and Kimber had actually been trained to be Hall's service dog. But when Hall seriously hurt his back and needed surgery, he asked Tackett to watch Kimber. Tackett jumped at the chance, happy to be around Kimber again. Everyone expected Hall to get better, but after the surgery, he actually got worse. So Hall made a hard decision - he asked Tackett to permanently adopt Kimber. "He didn't want to give her up, but he knew it was best for Kimber," Tackett said. 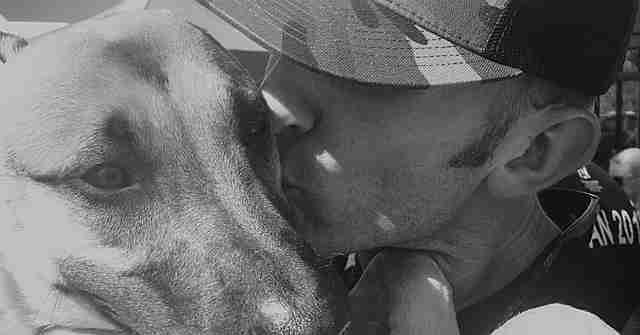 "To me that's the bravest thing he could have done, because it's his service dog for his comfort, and he knew he couldn't take care of her the way she deserved." Kimber has been living with Tackett since October now, and their bond has grown even stronger. Kimber is also quickly becoming a more confident dog. "It's amazing to see her transformation over the last couple of months - how she is with other guys, and other people in general," Tackett said. 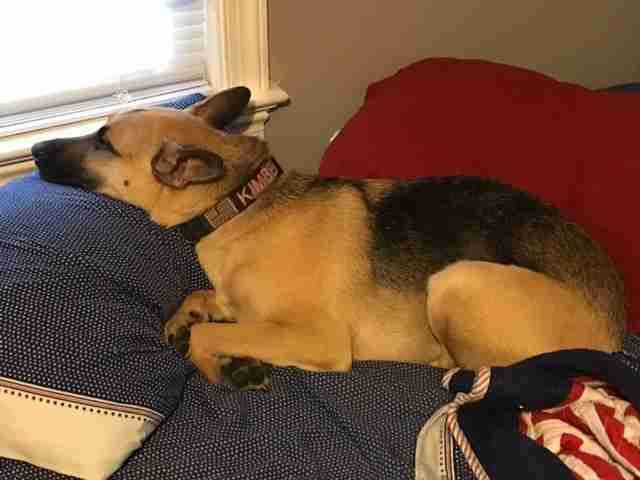 "She is an incredibly calm dog, but when it's time for her to play, she's so much fun. When you see her play with other dogs, you see her real personality come out. She's such a loving dog." Kimber also loves playing the part of a diva, Tackett said. "If you do something she does not agree with, she will purposely turn away from you and look away," Tackett said. "A lot of times she'll ride up on the front seat with me on my truck, but when my girlfriend comes in town, she goes into the back seat. Kimber doesn't agree with that at all. She will turn and face the back window so she doesn't have to look at me. It's hilarious." Hall is still recovering from his injuries, but visits Kimber whenever he can. And Tackett and Kimber couldn't be happier to be in each other's lives. "I love coming home to that little dog," Tackett said. "She's awesome. She's a very special dog." 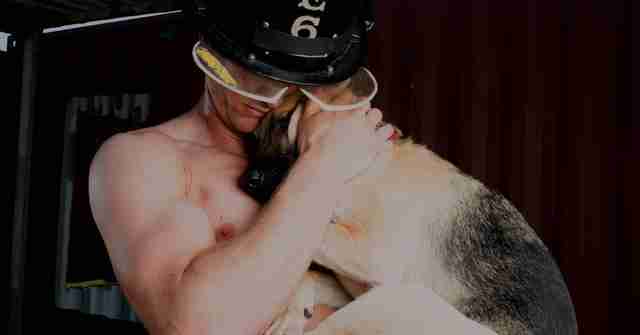 To support Charleston Animal Society, you can purchase a Charleston firefighter calendar here.